Commission of Marine Capt. Samuel Nicholas, 28 November 1775. 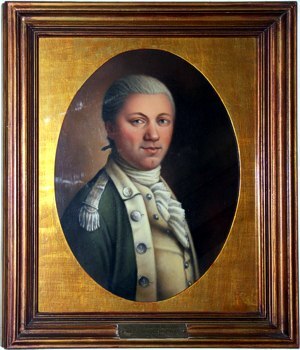 Samuel Nicholas (ca.1744–1790), senior officer of American Marines, was born at Philadelphia, the son of Andrew and Mary Shute Nicholas—his father a prosperous Quaker blacksmith; his mother sister of Attwood Shute, Mayor of Philadelphia 1756–1758. D.W. McComb photo, copyright 2008. Portrait of Major Samuel Nicholas at the Home of the Commandants, Marine Barracks Washington. In 1751 at age 7, sponsored by his uncle, he enrolled at the newly-established Philadelphia Academy (with which the College of Philadelphia, now the University of Pennsylvania, was affiliated upon its founding in 1754). With classmates from prominent Philadelphia families, many of whom played important roles in the Revolution 15–20 years later, he completed his studies in 1759. The next year, at age 16, Nicholas was admitted to the exclusive Schuylkill Fishing Company, whose “associates assembled frequently on the banks of the river for fishing, fowling and feasting.” In 1766, at age 22, he was one of the organizers of America’s first hunt club, the Gloucester Fox Hunting Club, some of whose members—“generally of conspicuous prominence in the affairs of the day”—formed in 1774 the Light Horse of the City of Philadelphia. By this time, Nicholas was proprietor of the popular tavern the Connostogoe Wagon, a business of the family of Mary Jenkins, whom he married in 1778. In 1775, the Second Continental Congress began looking for a means of resolving a chronic shortage of seaman for its fledgling navy. On 5 November, it commissioned Nicholas Captain of Marines. On 10 November, the date that today’s United States Marine Corps celebrates as its birthday, it authorized the enlistment of two battalions of Marines. Recruiting for duty aboard the 24-gun frigate Black Prince (later renamed Alfred) began at Philadelphia’s Tun Tavern whose owner, Robert Mullan, also was appointed captain. For more about Samuel Nicholas, see Samuel Nicholas, First Officer of American Marines by Major Louis Estell Fagan, II, USMC, first published in the Marine Corps Gazette, November 1933 and transcribed for this web site by Diana Spies Pope, great-great-great-great granddaughter of Samuel Nicholas. On 28 November, Congress confirmed Capt. Nicholas’s commission in writing and established his pay at $32 per month (this document, signed by John Hancock, was the first one issued for the Continental Naval Service, predating those of other early officers including Esek Hopkins and John Paul Jones, both of whom were shipmates on Alfred’s first cruise). Capt. Nicholas moved quickly. By the end of the year, he had raised five companies of Marines and then sailed with them under Commodore Hopkins to the Bahamas. There, in March 1776, he led 284 men in a nearly-bloodless raid on Nassau, catching the British entirely by surprise and capturing two forts, 88 cannon, 15 mortars and a huge quantity of military stores. It was the Marines’ first-ever amphibious landing and the most successful naval operation of the Revolutionary War. Capt. Nicholas was still embarked in Alfred during her pursuit of the British ship Glasgow off the Rhode Island coast on 6 April, and saw his second lieutenant killed while at his side on the quarterdeck during the 3-hour battle. Returning to Philadelphia, Nicholas resumed recruiting and training and, on 25 June, was promoted major. He led three companies, 131 men later reduced to 80, in the Trenton-Princeton campaign. Transferred to the artillery on 1 February 1777, they remained in the field with General Washington until the following spring when their terms of enlistment expired. Thereafter, as a senior officer but without a field command, Major Nicholas continued supervising recruiting and logistics in support of ships’ detachments of Marines. By the time of the British surrender at Yorktown, the Marines’ role had already diminished and in 1783, the then-39-year-old Nicholas returned to his business and social life in Philadelphia. He died there during a yellow fever epidemic on 27 August 1790, and is buried in the Friends Burial Ground. Diana Spies Pope, great-great-great-great-granddaughter of Samuel Nicholas. Scott W. Hawley, researcher of early Penn history. Smith, Charles R., Marines in the Revolution, US Marine Corps, Washington, 1975. Miller, Nathan, Sea of Glory, a naval history of the American Revolution, Annapolis, Naval Institute Press, 1974. Schuon, Karl, U.S. Marine Corps Biographical Dictionary, New York, Franklin Watts, Inc. 1963. Navy Department, Office of the Chief of Naval Operations, Division of Naval History, Ship’s History Section, History of Ships named Nicholas.